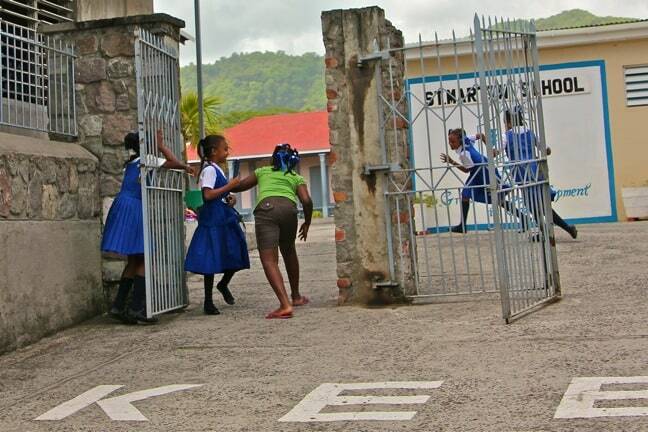 Our second day in Dominica began with a visit to the Kalinago Barana Aute, a.k.a. the Carib Model Village. When Christopher Columbus “discovered” the island in 1493, he named it Dominica because he spotted it on a Sunday (which is dominica in Latin) and called the natives Caribs. But then, as now, they called themselves Kalinago (men) and Kalifuna (women). Like most tribal cultures, the Kalinago got a raw deal during the era of Colonial Imperialism as the island changed hands between the French and British. In 1903 the British relegated them to the Carib Territory (now Kalinago Territory), a reservation on Dominica’s remote, mountainous Atlantic coast. The Carib Reserve Act of 1978 (the year of Dominica’s independence) reaffirmed the territory’s boundaries, land management and institutions of local government, and today the area is home to around 3,000 Kalinago people, who share ownership of all the land within the Territory. After a tour and overview of the tribe’s history, we made our way to the karbet, a meeting house that, in pre-Columbian times, would’ve been located at the center of the village. There we were met by costumed performers in traditional tribal dress, who gave us an overview of their traditional music and dance. 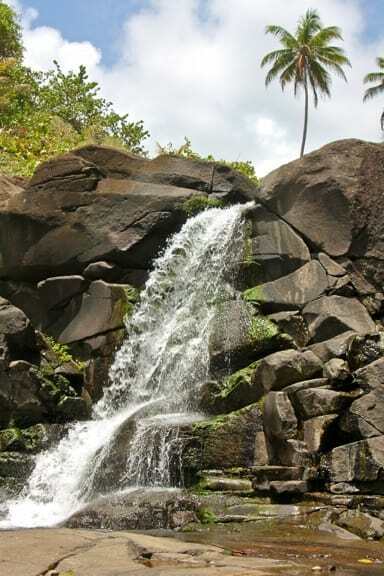 As the island emerges as an ecotourism hotspot, the desire to rediscover and preserve Kalinago culture has made the area an increasingly popular Dominica tourist attraction. It honestly felt a bit odd being the only people there, watching these people literally doing a song and dance routine to earn tourist dollars. But, in our conversations with our guides before and after this cultural performance, it became clear that the Kalinago are a proud people who welcome the opportunity to rediscover their own traditional culture and share it with visitors. Their native language, and many of their native traditions, had all but died out before the Kalinago Barana Aute was created in 2006. 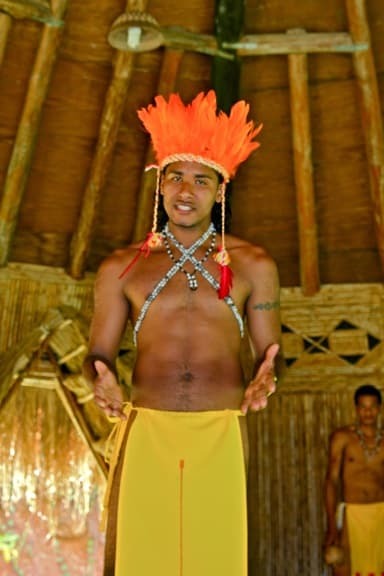 Now, travelers come from all over the world to witness one of the last remaining vestiges of indigenous Carib culture. Of course, it wouldn’t be a GGT story if Mary and I didn’t get in on the act. After a few songs, the lovely ladies invited us to join them onstage for a social dance in which each person moves to the center of the circle, links arms with their partner, spins around 180 degrees, then heads back to their place. The couple not dancing kept the beat by clapping and stomping their feet, chanting a simple call-and-response melody so infectious it got stuck in our heads for days. As a huge fan of tribal cultures around the world, I’ve always been fascinated by the myriad similarities tribes from disparate nations share. The colorful beadwork on this young lady’s costume reminded me of similar styles I’ve seen on Native Americans and Zulu tribespeople. After the performance ended, we explored more of the Kalinago Barana Aute, which included some spectacular ocean scenery and the beautiful Isulukati waterfall. 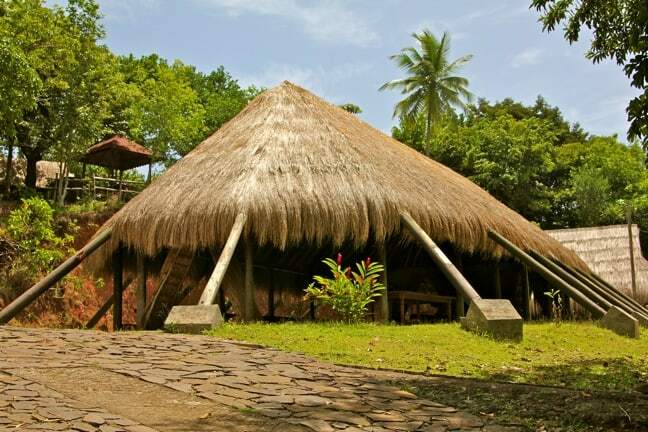 We also learned about the Kalinago Homestay program, which allows travelers to immerse themselves in the modern-day lives of the Kalinago people. 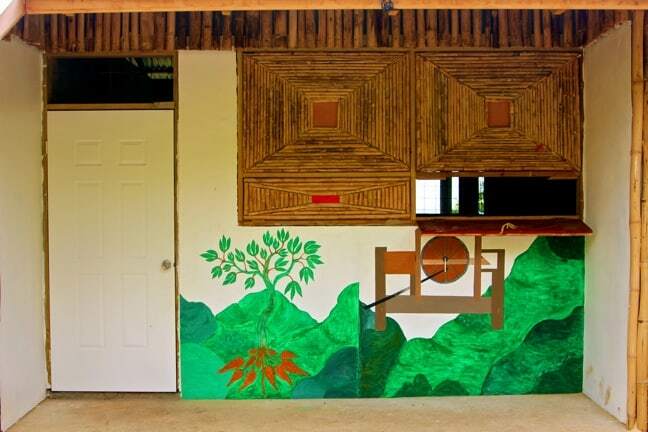 You can choose from three different types of accommodations, ranging from traditional housing (thatched/wooden huts) to a more conventional, modern home. Surprisingly, our guide says that almost everyone chooses the traditional housing, which is also the most expensive at $50/night. We would definitely do this if we went back to Dominica! Mary and I love traditional arts & crafts. 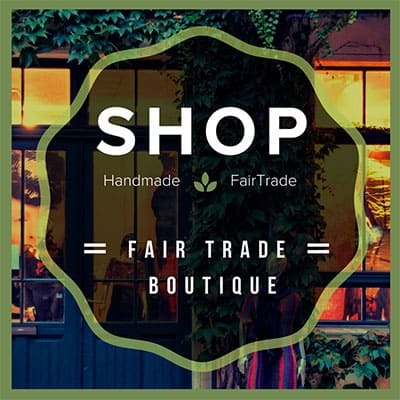 In an effort to practice the ecotourism ideals we preach, wherever we travel we make an effort to seek out indigenous artisans from whom we can buy directly. 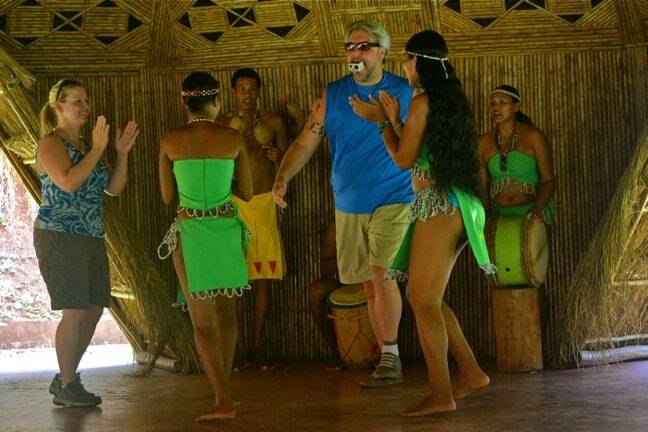 At the Kalinago Barana Aute, this is no problem, as they’re right there working as you finish your tour! 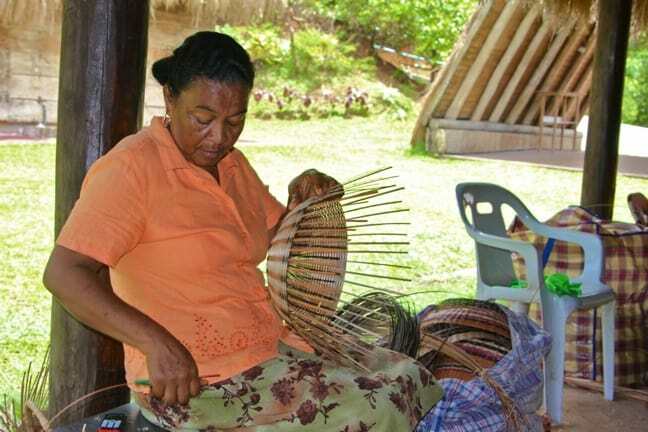 This woman was patiently weaving the Larouma Baskets for which the Kalinago are famous, using a reed (Larouma) that is believed to have been brought to Dominica from South America over 1,000 years ago. As the artist explained it, the reeds are cut down, then each one is manually divided into four thin, flexible strips that can be used for weaving. Initially a beige color, the strips are then dyed using natural ingredients to achieve a broad range of colors, including brown, black, purple and pink. 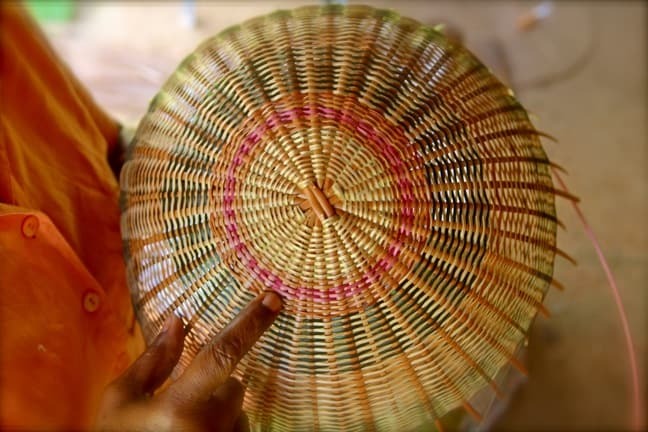 Each basket takes about a day to make, and on the day we arrived there were four women working non-stop, chatting away in the shade as they wove their masterpieces. Unfortunately we have a small house that doesn’t have much room for more stuff, so we settled for a small (but adorable) woven purse for Mary and some woven place mats for our dining room table. 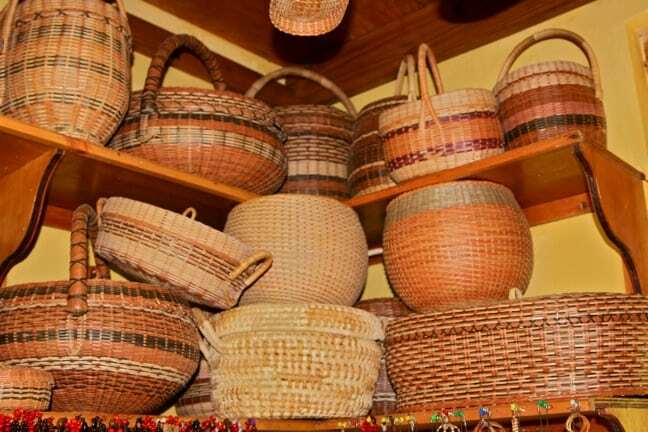 But if we had a bigger house, several of these awesome Larouma Baskets would’ve made their way home with us! 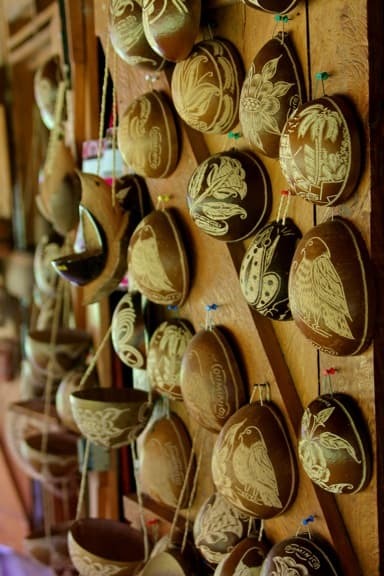 Similarly, if we hadn’t bought several similar items a few months ago during our trip to the Peruvian Amazon, I’m guessing a few of these hard-carved Calabash gourds would be adoring our walls right about now. Eventually it was time to leave the Kalinago Barana Aute and head to our final stop for the day: Daniel’s Cassava Bakery, which is also located within the Kalinago Territory. Cassava, which has been a huge staple of the Carib diet for centuries, had– like many elements of Kalinago culture– fallen from favor in Dominica for many years. 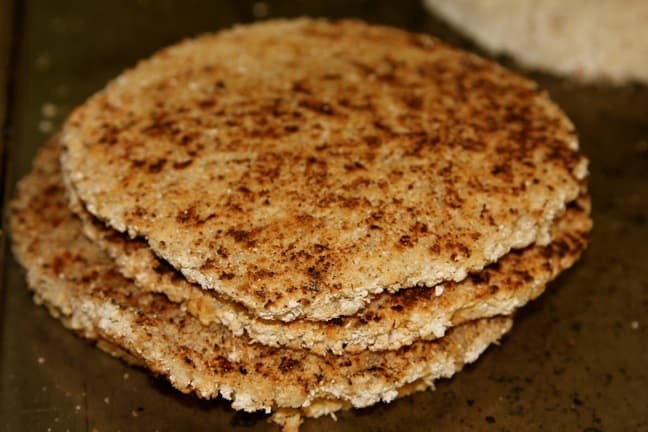 But owner Daniel Frederick has worked almost singlehandedly over the past two decades to help bring the tradition back, and these days the mere mention of his cassava bread brings a huge smile to locals’ faces, as if you know some amazing Dominican secret. 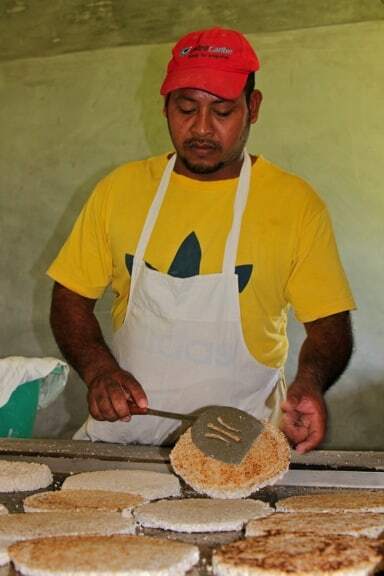 Using a traditional recipe that has been passed down for generations, Frederick grinds fresh manioc (grown on a farm directly across the street), then mixes it with coconut, sugar and a little water and forms it into the shape and size of a small frisbee before cooking it on a wood-fire grill until brown and crispy on the outside. We were practically foaming at the mouth from the aromas emanating throughout his shop, which stayed constantly busy the day we visited. Daniel’s not open every day, but when he is, the man’s cassava bread is EXTREMELY popular. Daniel’s Cassava Bread, All For Me! So popular, in fact, that he’s gradually had to increase the size of his location in order to keep up with demand. In the 20 minutes or so we waited for this batch to cook, no less than 4 cars stopped by his window to inquire how much bread he had available, until he had to tell people to come back later so he could have time to cook another batch. Luckily for us, we got a half-dozen pieces (to share with Oris), and greedily wolfed down a mildly sweet, fragrant, chewy loaf immediately upon getting back in the car. It was incredible, and definitely a must-try if you make it to Dominica. It was late afternoon by the time we made our way through Roseau on our way back to Rosalie Bay Resort. Where the Rosalie Bay area was the perfect picture of remote, rural tranquility, the capital city was bustling with activity.